In 2001, Brenda Tibbs signed up for an introductory flight at an airshow at the Frederick Municipal Airport in Frederick, MD. Little did she know how one quick flight would quickly change her life. “I was hooked ever since!” she exclaimed. 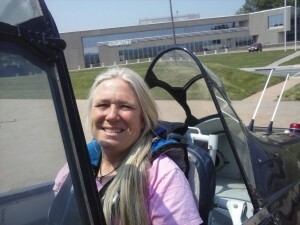 Brenda began flight instruction immediately and would later become a flight instructor herself. After serving as a chief instructor at a local flight school, Brenda decided it was time to start her own school, Bravo Flight Training at the very airport where she first fell in love with aviation. Based out of the Signature FBO, Bravo Flight Training offers all levels of flight instruction including flight reviews and instrument proficiency checks. A Designated Pilot Examiner (DPE) is also available on field. Bravo’s growing fleet currently includes a Cessna 150 and Cessna 172. Within the next few weeks a Piper Arrow will be coming on board and there are plans to add a Cirrus in the future. Online scheduling is available for ease of access to Bravo instructor and aircraft schedules. The Frederick Municipal Airport is located in Frederick, MD just outside of Washington D.C.’s Special Flight Rules Area (SFRA) where Bravo offers superior training in this complex airspace. The local pilot community benefits from the addition of Bravo Flight Training on their field. Recently, Bravo offered a free Aviation Jeopardy educational event and pilots have a “Meet the DPE” forum to look forward to on October 13th. To learn more about Bravo Flight Training visit https://www.bravoflighttraining.com/ or like their page on Facebook! It all starts with flight schools in the general aviation industry. Whether you manage a start-up or established flight school, Aviation Insurance Resources (AIR) can obtain flight school, flight instructor and flight simulator insurance at a competitive rate for you. To find out more please contact Aviation Insurance Resources by calling 877-247-7767 or complete our quick and easy flight school quote request today.